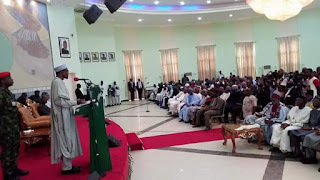 President Muhammadu Buhari on Monday said that government was deeply worried about the incessant attacks on Benue’s rural communities, and vowed to end the menace very soon. Buhari, who met with farmers, herdsmen, government officials and other stakeholders in Makurdi, denied insinuations that he was not interested in what was happening to the north-central state. “I cannot overlook the killings in Benue or any other part of Nigeria. I cannot do that. I am genuinely worried about the attacks in Benue and we are doing everything to end them,” he said. Buhari said that he was surprised at the revelation that the Inspector-General of Police, Ibrahim Idris, did not spend 24 hours in Benue, when he directed him to relocate to the state and remain there till peace was restored. “I am getting to know this in this meeting. I am quite surprised,” he said. He, however, said that the meeting was not the best place to expose the inefficiency of his appointees, and appealed to Benue people to exercise restraint and live in peace with their neighbours. Buhari appealed to the people to pay more attention to farming, especially rice cultivation, saying that rice importation had dropped by 90 per cent since some states embarked on massive production of the commodity. Speaking earlier, Gov Samuel Ortom appealed to the President to upgrade the ongoing military exercise in the state tagged “Ayem Akpatema”, to a wider operation to effectively curb herdsmen attacks. He urged Benue people to learn to live in peace with other people. Ortom said that many states were currently involved in massive cultivation of rice, and urged his people to join the trend. The governor reiterated his call for the arrest of the leadership of Miyetti Allah Kautal Hore, alleging that the body was responsible for the killings in Benue. Ortom maintained that ranching was the best option for cattle breeding in Nigeria, and advised herdsmen to embrace it so as to minimise the clashes caused by open grazing. He also called on the federal government to take over the management of the Benue University Teaching Hospital, College of Education, Katsina-Ala and Benue Polytechnic, Ugbokolo. Malam Shetima Mohammed, a representative of Miyetti Allah Cattle Breeders Association of Nigeria (MACBAN), Benue Chapter, however, denied responsibility for the Benue attacks. “Our association is a peace loving one and the exact opposite of what is being portrayed,” he declared.